When it comes to the grace and charm that only Florida waterfront properties possess, there are none more glamorous than the condominiums at Key Tower South. Constructed in 1970, they offer a special elegance that's only found on the Gulf coast. With 87 residences known for luxurious floor plans and spacious accommodations, Key Tower South offers the perfect option to let anyone enjoy Florida luxury at its best. Read More About Key Tower South. Included below are condos for sale in Key Tower South, a community on Lido Key. These Key Tower South real estate listings are updated daily from the MFRMLS. With its social and recreational options, Key Tower South is the place to be for retirees as well as young professionals who work in Sarasota. Most units, which consist of two or three bedrooms, offer a number of amenities including a large heated pool for a swim after a hard day at the office, assigned covered parking spaces, a clubhouse which includes a fabulous recreation room, an extensive on-site resident library, and much more. Along with its luxury living quarters, Key Tower South is conveniently located near downtown Sarasota and many of the areas finest beaches. 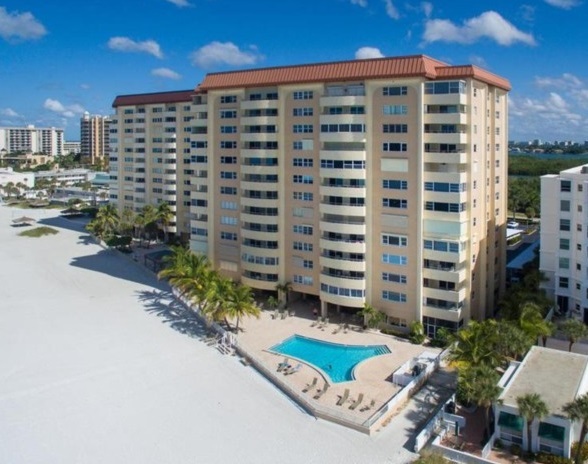 Whether it's Lido Beach, Siesta Beach, or numerous others that have been rated as some of the best in the United States, there's no doubt Key Tower South is the perfect place for those who want fun in the sun. With its extraordinary views of the Gulf of Mexico, South Lido Key Park, and Sarasota Bay, these fabulous condos offer residents of all ages the chance to lead the active lifestyle they've always enjoyed. Just minutes away from many of the area's best golf courses, tennis courts, beaches, and boating and fishing options, Key Tower South can provide any number of recreation opportunities for its residents. Along with all this, these beautiful condos are conveniently located near downtown Sarasota's best shopping, dining, and cultural experiences. With its acclaimed cosmopolitan lifestyle, Sarasota and the surrounding area offer something for everyone. Whether it's a day spent at a museum, viewing masterpieces at an art gallery, or enjoying a local music festival, residents of Key Tower South can look forward to enjoying a different experience each and every day. Key Tower South not only enjoys great weather and amenities, but also has plenty of friendly neighbors. If you're looking to live the good life in your later years or just want to love where you live and work near many of Sarasota's best attractions, then Key Tower South is the place for you.